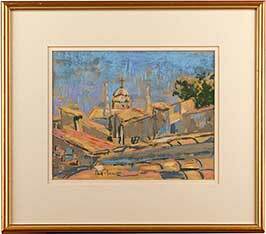 Notes: A very attractive limited edition print, by the British born artist Philip Martin. This print shows a view of one of the old street corners in Midhurst, West Sussex. This is a modern, high quality digital print of the original watercolour, completed by the artist in around the year 2000. 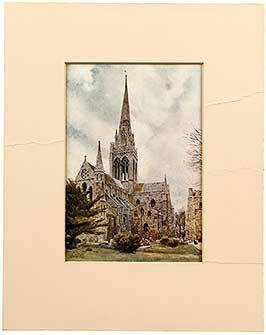 It has been Hand Signed, Titled as 'Midhurst' and Edition Numbered in pencil by the artist, P. Martin. This is number 286 of an edition limited to 850. Philip Martin was born in Brighton in 1952 and began a career in architecture whilst continuing to paint in his free time. Soon enough though demand for Philip's artwork grew to the point where he decided to give up his architectural path and concentrate full time on his painting. He has exhibited widely across Britain, and has been commissioned by a large number of publications, companies and individuals. He now lives and works on the outskirts of Cambridge enjoying the continued success of his watercolours. This is a fine reproduction print, with such detail and a finish that is so true to the artist's medium, that it is hard to distinguish it from the original watercolour artwork. This artwork is perfect for mounting and/or framing. Further Information: Midhurst is a charming little town on the banks of the river Rother, in the heart of the South Downs National Park in West Sussex, and is home to the Park's new Visitor Centre. Along the Midhurst Town Trail visitors discover historic Tudor buildings gourmet restaurants and cafes, independent shops and one-off boutiques and over 100 listed buildings with charming local character. Some of the South Downs finest vineyards are nearby. Despite its small size, Midhurst today is a bustling market town and truly a little gem, nestled in a beautifully picturesque and nationally recognised area of outstanding natural beauty. The surrounding South Downs area is equally complimented by wonderfully diverse countryside including acres of attractive downland, woodland, wetland and heath. Numerous National Trust properties, parks and museums also lie within a stone's throw of Midhurst giving the area a distinct diversity of culture and liveliness whilst retaining a quintessentially English character. The town of Midhurst is also the home of The Midhurst Gallery, where we have been established for over 30 years.